Reading a new article on The Gear Nuts about foot care packages from Trail Toes called Foot First Aid which is essentially a does-as-it-says-on-the-tin product for Foot Rescue; a 3-in-1 bundle that provides Bag 1 – preventative, Bag 2 – maintenance and Bag 3- remedial products and care for your feet. Following my own experience in The Beast last year where I succumbed to foot problems leading to a Short Coursing of the team my feet and care for my feet is my No. 1 priority for this year. From the Gear Nuts site, it lead me to read some solid advice on the TrailToes.com site about Foot Care that applies to pretty much anyone hiking, running or enduring. If you don’t look after your feet it is going to get very messy, very quickly!! The feet of runners can be can be broken down into two basic types. The first are those that don’t need anything. Regardless of the distance, these lucky few don’t really have to do anything and they don’t usually have event limiting problems. The second type, are far more unfortunate because these runners tend to get blisters regardless of what they seem to do. 1. Ensure your shoes fit well and that they have enough room in the toe box, forefoot, and that the heel is set firmly in place without play. This will help reduce movement and therefore friction and the dreaded outcome they produce. Absolutely critical in the first place. There is no point being a whizz at foot care if your shoes are wrong. All you will be doing is dealing with fixing the symptoms rather than dealing with the cause. Easy for me to say but get help with selecting your footwear. Use the knowledge and experience of trained footwear specialists, that is what they are there for. 2. Wear socks that don’t absorb and hold water. Change them when they get dirty and gritty. If you don’t it just helps create a nidus for skin breakdown. Nothing like a little sand to cause skin abrasion. (My highlighting) This was my downfall last year. On account of plenty of time with my feet on a sandy river bed I ended up with grit in my footwear. Unfortunately while I changed my footwear I did not have clean dry socks and not realising the sand was embedded in the fibers of my socks (I discarded them after the event when I realised my mistake) that was the source of my initial hotspots and ultimate blistering issues. 3. If you use a lubricant, and we recommend Trail Toes Phenomenal, Ultra-Extreme, Anti-Friction Foot Cream, apply a thin layer for short runs, if you are going longer then consider doubling the amount. Ensure there is an adequate amount between the toes. Have never used a foot lubricant as I felt this would soften the skin and possibly lead to problems. Something I will be testing out on a few events early in the season. 4. About 4 days before your run ensure your toes nails are trimmed and not beyond the end of the toe. Be careful you don’t cut too deeply into the nail fold. If you do get overzealous the wounds should have healed by by your start date. Very clever!! Cut them too short and you know all about it, give a bit of time and they will grow out to a comfortable length. 5. During your run, especially during multi day events, clean your feet and dry your socks and shake them out. Consider changing daily. If not at least try and wash them to get the excess sand and dirt out of them. 6. As soon as you feel a blister coming on, stop, rest, dry and air your feet. This down time may help decrease the growing hot spot and help you avoid blister formation. 7. If you get a blister, pop it and dress it using your favourite technique. However, at the end of the day, take the dressings down to let your feet dry out. If you leave the dressings on you increase the risk of trapping and possibly prolonging the problem. In case I can not get my mitts on a Trail Toes – Foot First Aid pack, I will be packing Compeed plasters in all shapes and sizes in a ziploc bag just for emergency use. 8. One common technique for draining blisters is to take a needle with some cotton thread and it feed through. This allows the blister to stay open and the thread will absorb some of the fluid. Once the blister closes back up it is likely to refill with fluid so be prepared to drain it again. 9. For your toe nails, get and 18 or 16 gauge needle and simply rotate it counter and clock wise until it breaks through and you see fliud draining through it. I like to make about three this will help keep them open. Just be aware that there will be some discomfort as teh air hits the new hole, but more if you go too deep and put the needle into the nailbed. Just do it slowly and cautiously and will will not have any problems. I do this as early on as I can to ensure the nail stays in place. Just don’t let it get to this stage. Simples. Now all that is left is point 10 which probably should be at the top. One more addition to my reading list and soon to be on my shelf. 10. Consider purchasing and reading the book Fixing Your Feet by: John Vonhoff, for more detailed information. Of course there is no point having all this equipment and reading up to have all this knowledge if you don’t put it into practise. So now is the time to be working on your footcare, testing out your sock combinations, packing your gear so you know where it is when you need it. 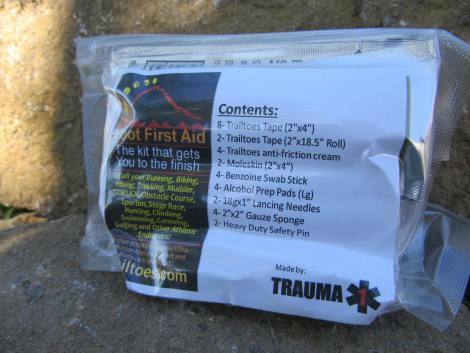 Last thing you want is to be suffering with your feet and then discover that your Foot First Aid pack is back in the last TA in the bike box. I’ll be fitting it in a waterproof pouch inside my racepack and where I go, it goes. Silva letting us see the light! Having a splash in the new kayak..